MARK NANCE/Sun-Gazette Muncy’s Bryce Vollman wrestles with Warrior Run’s Noah Hunt during their 132-pound bout on Tuesday at Muncy. Vollman won by decision, 8-4. MUNCY — The swelling under Bryce Vollman’s right eye was increasing rapidly Tuesday night, and it was more colorful than a rainbow left by a summer shower. 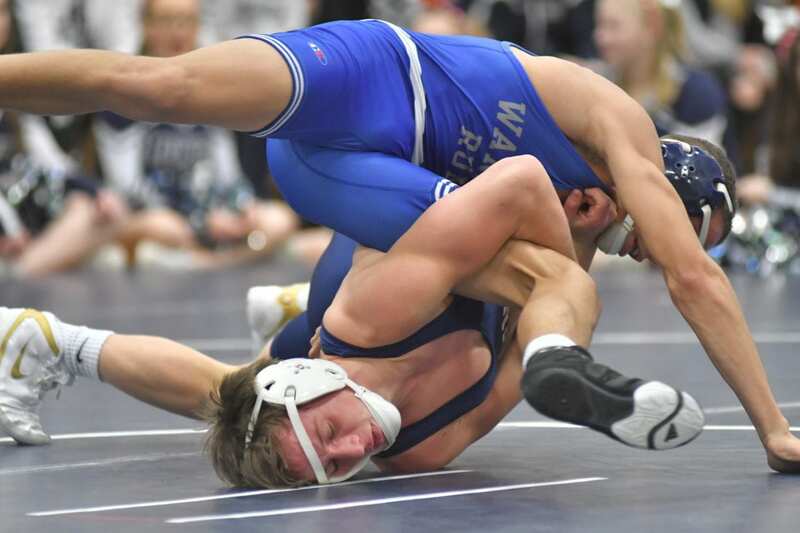 The Muncy sophomore doesn’t really know when he got hit during his 132-pound match, causing the puffy black and blue mark to appear. But he knows he felt it during the course of his bout with Warrior Run two-time state qualifier Noah Hunt. In the immediate afterglow of his victory, Vollman didn’t care too much about his eye. “It’s all worth it in the end,” Vollman said with a perverse smile. Vollman’s win over Hunt sent an energy through the No. 3-ranked Indians. Despite wrestling without four starters, Muncy posted a 61-18 win over Warrior Run by recording eight falls. Vollman’s 8-4 win over Hunt was the marquee result for Muncy, but the balanced production from the entire lineup is what turned one of District 4’s best rivalries into a bit of a laugher last night. Muncy continued to wrestle last night without former state placewinner Jacob Blair who continues to deal with a knee injury, as well as state qualifier Coleman Good, who is dealing with an elbow injury from football season. Also missing were heavyweight Coty Steele and Gavyn Eisenhower. Despite missing nearly 100 wins from those four, Muncy found a way to make up for the losses. First it was Gavin Hillman stepping in at 285 pounds and throwing in a power half to earn a fall. Then it was Grady Oden stepping into the lineup late and earning a fall at 120 pounds. Tristen Ditzler added one of the team’s eight falls to win at 195, and Cael Hembury picked up his 12th of the season with his 11th fall at 220 pounds. From there, it was wrestlers like Vollman and state-ranked Mario Barberio, Christian Good, Ethan Gush and Mike Kustanbauter who helped put a tidy little bow on the lopsided victory. Freshmen Ty Nixon and Chase Crawley added victories, too. There was no feeling sorry for themselves for what they were missing from the lineup. Instead, whoever got an opportunity to put their toe on the line found a way to take advantage of that chance. It was Vollman’s win which set the wheels in motion for that kind of performance from the Indians. He took the fight right to Hunt from the first whistle, scoring a takedown just over 30 seconds into the bout. He then ran an arm bar for three near-fall points but couldn’t quite get the fall. It was early in the second period when he got hit on the right cheek inadvertently causing the area just under his eye to begin swelling. Vollman could see it was blowing up like a balloon and he felt like it slowed his pace a little bit. Hunt scored a takedown of his own in the second period and added another in the third when the bout was all but decided. But Vollman’s early pace led to the his 5-0 lead and allowed him to wrestle the final four minutes a little safer. Warrior Run coach Jeremy Betz could only shake his head at the thought of this being an undermanned Muncy lineup. He knew his inexperienced team was in for a tough battle with the returning state team championship fourth-place finishers. But Betz walked out of Muncy High School pleased with the effort his team continues to bring to their matches. The Defenders didn’t have any placewinners at last weekend’s King of the Mountain before wrestling Muncy last night. And Thursday they’ll take on the state’s top-ranked team, Southern Columbia. It’s a string of events Betz knows is probably not going to end well, but he’s more concerned with seeing the consistent fight from his team. He welcomed the opportunity last night for Hunt to take on Vollman last night at 132 pounds despite Hunt being about ready to drop to the 120-pound weight class. He welcomed the opportunity for his youngest wrestlers to take on state-ranked opponents. 126: Jaiden Hanford, WR, pinned Seth Vickery, 0:38. 132: No. 19 Bryce Vollman, M, dec. No. 15 Noah Hunt, 8-4. 138: No. 19 Mario Barberio, M, tech. fall Logan Witmer, 16-0, 4:45. 145: No. 23 Christian Good, M, pinned Nathan Michael, 2:54. 152: Grady Miller, WR, won by forfeit. 160: Ty Nixon, M, pinned Damein Moser, 0:44. 170: No. 21 Ethan Gush, M, tech. fall Sam Crawford, 16-1, 6:00. 182: No. 16 Mike Kustanbauter, M, pinned Jackson Welliver, 1:26. 195: Tristen Ditzler, M, pinned David Gearhart, 1:31. 220: Cael Hembury, M, pinned Hoyt Bower, 2:55. 285: Gavin Hillman, M, pinned Caleb Long, 1:59. 106: Kaiden Majcher, WR, pinned Alex Maiorana, 3:22. 113: Chase Crawley, M, pinned Landan Kurtz, 2:21. 120: Grady Oden, M, pinned Connor Kertsmar, 2:46. Takedowns: Muncy 20, Warrior Run 5. Records: Muncy (3-0); Warrior Run (1-1).